The BFE's Research Manager Jon Bale reviews Zukor's Grind - A next-generation feedback game for neurofeedback and biofeedback. "We're having trouble engaging our younger patients. Do you have anything that's good to use with kids?" "I'm looking for something that's more video-gamey..."
"Do you have any feedback better than just these animations?" These are some of comments I receive in emails and hear from time to time in the BFE online sessions. Clinical applicability and concise data collection are definite cornerstones in biofeedback and neurofeedback, but health professionals also care about subject engagement. They want their feedback tools to impress their clients with cool graphics and imagery, illicit of video games we see on the market today. Watching animations or DVDs is not always enough, so clinicians are always keeping their eyes open for that next application that can capture the attention in their practice. This is where Zukor's Grind comes to impress. Zukor's Grind is both a biofeedback/neurofeedback training tool and video game. The normal type of training that we are all accustomed to is with bar graphs, thresholds, feedback animations and/or DVDs. 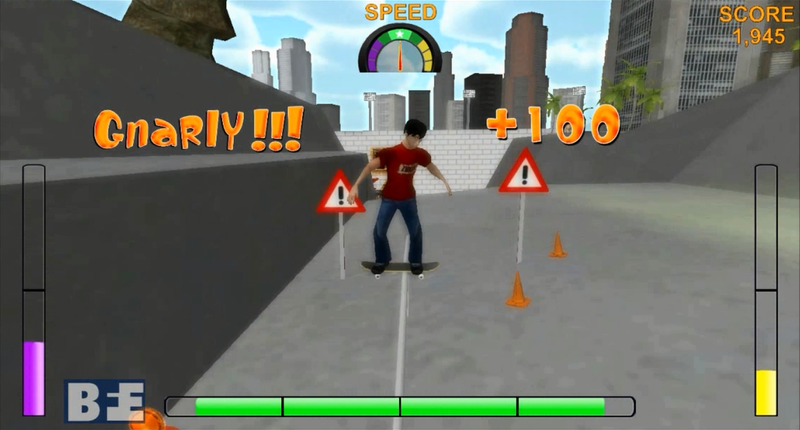 Zukor's Grind enhances training by replacing the simple feedback animations and DVDs with a feedback skateboarding game. Changes in the subject's physiology or brainwaves dictate the pace and progress of the game, the number of points scored, what skateboarding tricks are achieved, and which special effects are activated. If, for example, you are training the subject's heart rate variability using spectral frequencies, as the Low Frequency (0.08 - 0.12 Hz) percent of total power increases, the skateboarding character performs a variety of skateboarding tricks and gains points to reward the subject. If self-regulation is maintained successfully for longer periods of time, periodic special events take place to reward the player as the skateboarding character progresses through the choice of levels. There's no doubt in my mind that children and teenagers (and even some adults) will respond to Zukor's Grind. It is similar in terms of visual design and detail levels to what one can find on the market for true video games. Those younger subjects that are marked with difficulties paying attention and responding to a computer screen, who often remark "this is boring", will become a little less difficult for you. The many settings that control the feedback in the game can also be easily toggled on and off, meaning each cool effect, sound or background feature can be adjusted. Progressively adding or changing game elements every few sessions could continually spur the subject's motivation with the therapy. A question that arose: would I really want to use the a video game-like tool with an ADHD boy, where I am down-training Theta (4-8Hz) and up-training Beta (15-21Hz)? Would I be improving attentional issues, or simply presenting something that the subject would naturally already respond to? Would this training extend to mundane moments when attention is important, like listening to a boring teacher? My above, initial concerns with Zukor's Grind regarding novelty and over-stimulation were alleviated by regulating the game's use and adjusting game settings. The game can be used as a reward from "standard" training, such as the last 5-10 minutes of a successful training session. Even if the subject's ability to pay attention is based somewhat on the novelty of the game and the its flashiness, they are still be training during these "reward periods". The game's detailed setting can also be turned down, in order to avoid artificial attention unrelated to the subject's "working to focus". To see for yourself, play my review video below to get a better idea of what the game looks like, the settings you can play with and how the game is set up from the perspective of both the clinician and client. 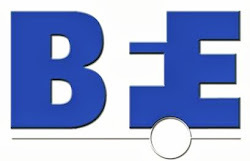 At the BFE, I maintain an air of skepticism when manufacturers and developers come to show us their amazing, must-have product. Most of the time, what they have to present does not interest me. Personally, I lose immediate interest with any hint of marketing buzzwords and over-descriptive use of adjectives. My initial reaction to the Zukor's Grind pitch was similar, but upon using the game in a training session my opinion quickly changed. I'm stoked for skateboarding with my brain! Zukor's Grind is now available in the BFE Online Shop. Click here for more information.